During WWII, nearly sixty years after its humble beginning as a soda fountain drink, over five billion bottles of Coca-Cola were sent to servicemen and women in every corner of the earth. Created in 1886 by pharmacist Dr. John Pemberton, the syrupy goodness was combined with carbonated water to create a drink that was "delicious and refreshing." Pemberton's partner, Frank Robinson devised the name and logo that continue to this day. But it was businessman Asa Candler who purchased the rights after Pemberton's death, and launched the product into a well-known, sought-after beverage. 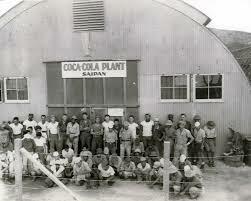 By 1899 large scale bottling of Coca-Cola allowed it to be sold nationwide, mostly commonly to farms and lumber camps. As Coca-Cola became more popular, the company had to fight "knockoff" drinks being promoted as the genuine product. In 1916, a unique contoured glass bottled was created to differentiate the beverage from others with its distinct shape. The company continued to grow, and by the late 1930s was bottled in forty-four countries. 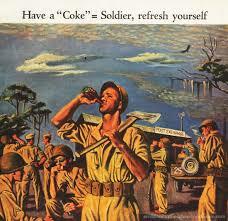 When America went to war in 1941, so did Coca-Cola. Company president Robert Woodruff issued a decree: "Every man in uniform gets a bottle of Coca-Cola for five cents, wherever he is and whatever it costs the company." To execute the order, a group of employees called Technical Observers were tasked with supervising and operating the overseas bottling plants. Nearly 150 men served as "TOs" and were given Army rank, pay, and uniforms with a unique identification patch. The plants were set up as close as possible to combat zones. Portable soda fountains and dispensing units called "jungle fountains" were sent to the remote areas of the war. Over one thousand of these units were used in the Pacific Theatre alone. 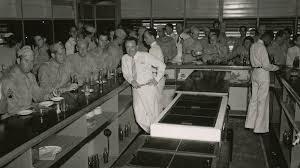 This popular taste-of-home went a long way to boost troop morale, but it also gave locals in dozens of countries their first exposure to the beverage, thus creating a market after the hostilities ceased in 1945. What American food or drink have you experienced overseas?